The sun has finally returned after a miserable rainy week. It is May already and I could not believe it when the temperature dropped back to the 40s at the beginning of this week. Since it is finally sunny and warm again today, my partner and I decided to celebrate by firing up our grill. We both love grilling when the weather is nice and doesn’t everything taste good on the grill, whether it is meat, seafood or vegetables? Grilling also requires little preparation time as well as easy clean-up. The trick for grilling fish is to make sure your grill is hot enough and the grates are well oiled. Besides, you should flip the fish only when it has released itself from the grill, otherwise it will stick. This applies to both grilling fish fillets and whole fish. I did not know there is such a thing until about a month ago when our fishmonger introduced it to us, saying it is his favorite fish for grilling. Opah, also called moonfish, is very popular in Hawaii. It has translucent pinkish flesh, which turns white when fully cooked. I like both its flavor and texture and I think it is a hybrid of tuna and Chilean sea bass. Opah has high fat content and when fully cooked, it is still moist, firm but not dry, with mild and buttery flavor. 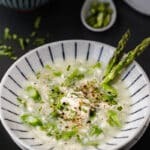 I used very simple seasoning in this recipe, mainly salt and pepper, because the fish itself is already buttery and delicious and the asparagus is so tender and sweet. 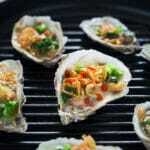 Salt and pepper help to enhance instead of masking their flavors. Here’s the fun fact: opah is the first warm-blooded fish ever found. 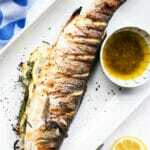 This fish is rich in omega-3 fatty acids, niacin, selenium and phosphorus. However, some articles say it also has a moderate to high level of mercury so opah should be eaten in limited amount and pregnant ladies may want to avoid it. Use 1/2 teaspoon of olive oil and salt and pepper to season the fillets on both sides. 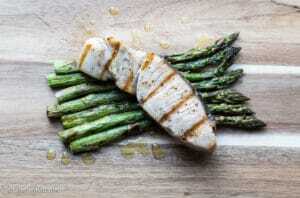 Coat the asparagus with 2 teaspoons of olive oil, and season with garlic powder, salt and pepper. 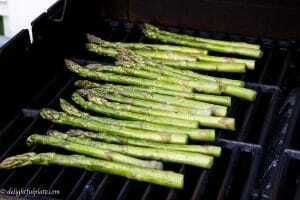 Set up the grill for direct cooking and place asparagus directly on the grill over medium heat, let it cook for 4 - 5 minutes. After asparagus has been cooked for 4 - 5 minutes, turn the asparagus to cook the other side. 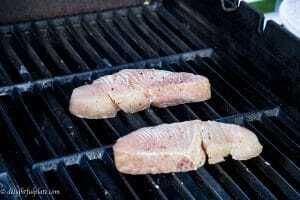 Place the opah fillets on the other side of the grill over medium high heat. Let the fillets cook for 2 - 3 minutes. After the opah has been cooked for 2 - 3 minutes or until it releases itself easily from the grill, flip and cook the other side for another 2 minutes. 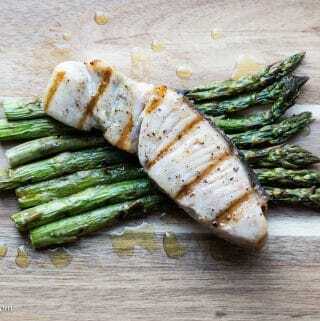 Remove both opah and asparagus from the grill, drizzle the lemon sauce all over and enjoy. Mixed juice of 1/4 of a small lemon with 1 tablespoon of olive oil with a tiny bit of salt thoroughly to combine. Adjust with more salt and lemon juice to your liking. Thank you! I’m glad to hear that :). This was on sale in my local Whole Foods today so I bought some to try and came across your recipe once I got home. 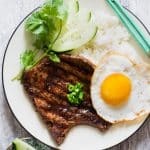 I can’t believe this isn’t a more popular fish – great tasting and your simple method of prep is perfect for the flavors of this fish. Hi Mark! Thank you for leaving me such a kind comment and I’m happy to hear that you like the simple prep method for this fish. 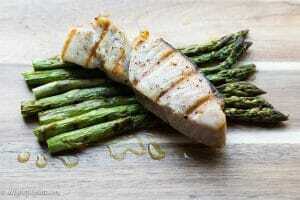 I personally like it for grilling more than other firm white fish such as swordfish and mahi-mahi. If my fishmonger hadn’t recommended it, I would probably have never tried it.